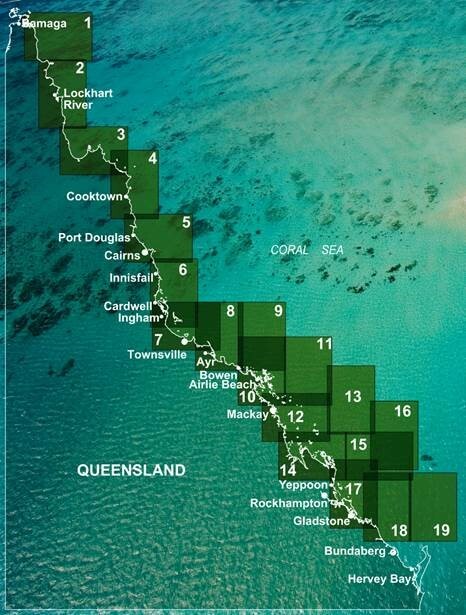 The Great Barrier Reef Marine Park zoning maps are tools to help you get to know the zones in the Great Barrier Reef Marine Park and Great Barrier Reef Coast Marine Park. You can avoid fines if you get to know the zones and what is activities are allowed in each zone. Zoning exists in the Great Barrier Reef Marine Park to protect plants, animals and habitats. Like a town planning scheme, it defines what activities can occur in each location. If you’re heading out on the water make sure you bring a zoning map with you so you can follow the zoning rules and avoid a fine. We’ve released new look maps to provide you with more information. The zoning itself has not changed, just the look and extent of the maps shown on each map.